Nashville voters will decide the fate of the city's mass transit proposal on Tuesday. The pro-transit coalition says it sent 25,000 text messages in the past week and enlisted 300 volunteers over the weekend, while the anti-referendum side has put together one last debate at North Nashville barbershop, Mogul’s. “We’re trying to be everywhere,” said Transit For Nashville spokeswoman Kelly Brockman. “It’s going to be an intense focus on getting voters to the polls,” said No Tax For Tracks spokesman Jeff Eller. In terms of funding and campaign size, there has appeared to be a mismatch — with more money and a larger volunteer base working in favor of the transit plan. The pro-side will soon complete a run of 12 mailers, about twice as many as opponents, and have hosted roughly 130 events over four months. Campaign spending has been not quite 2-to-1 tilted toward the pro-side. And while the opponents won’t share their phone banking tally, the pro-side has been doing upward of 4,000 calls per night for about three months. Which messages will register at the polls is still either side’s guess. One thing they agree on: the high turnout during early voting, which topped 59,000 ballots, was a positive sign for voter engagement. Yet observers have struggled to say what the turnout means for the outcome. The political action groups — for and against — spent a combined $1.5 million in the first quarter of the year, and had an additional $500,000 on hand headed into April. 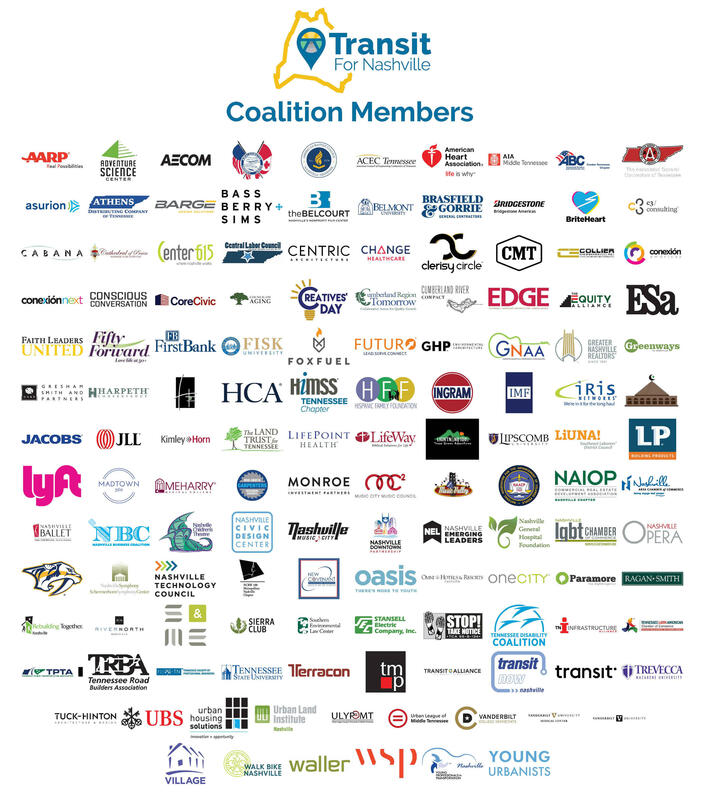 This graphic by Transit For Nashville shows some of the organizations that are part of its pro-referendum coalition. The Transit For Nashville coalition appears to be the largest group, by far, with more than 130 organizations signed on. They include the Nashville Area Chamber of Commerce, large employers like Bridgestone, HCA, Asurion, most of the universities in the city, real estate and hospitality organizations, law firms and several nonprofits. There are two groups with funding against the plan. No Tax For Tracks hasn’t shared its membership, but key individual donors from the group's latest disclosure include Joseph Scarlett, former CEO of Tractor Supply Co.; leaders of the Freeman Webb property management company; Dale Allen, a partner in the Allen and Reese law firm, Barney Byrd, president of Gen Cap America; and leaders with Avondale Partners investment banking firm. The group’s largest funder, by far, is a 501(c)4 organization, Nashville SMART Inc., which has not disclosed its donors. More recent opposition activity has come from the Stop The Train Committee, backed by Americans For Prosperity. Mayor David Briley stands alone as the mayoral candidate in favor of the transit plan. Candidates Erica Gilmore, a Metro councilwoman, and state Rep. Harold Love Jr. have flipped to oppose it, and there’s been strong opposition from conservatives Ralph Bristol and Carol Swain. On the Metro Council, The Tennessean reported that nearly twice as many members support approval than oppose it, and some are undecided. Strong supporters include council members Jeremy Elrod, Bob Mendes, Kathleen Murphy, Burkley Allen, Brett Withers and Freddie O’Connell. Vocal opponents include council members Steve Glover, Robert Swope, John Cooper, Dave Rosenberg and Angie Henderson. Regional endorsements have come from the Greater Nashville Regional Council, as well as from regional leaders like Clarksville Mayor Kim McMillan and Robertson County Mayor Howard Bradley.